You'd think I run a charity here, the way I've been just giving stuff away lately. So going along that same vein, I went ahead and posted that classic tale of the just murder of a carpetbagging sonofabitch by the goodly townsfolk whom he'd exploited. I trust you'll enjoy it. Once you've given it a gander, listen to our other songs again to get refilled with the cleansing waters of the Holy Spirit. Or go to Hell. I guess the choice is yours. We posted three more songs to make your day unbearable. Check out our profile to hear "Death of a Shuckster", "Burial At Sea", and "Psalm of Woe", all courtesy of GraveWax Records and yours truly. The first two songs are also available on our album, "The Kingdom Is On Fire". 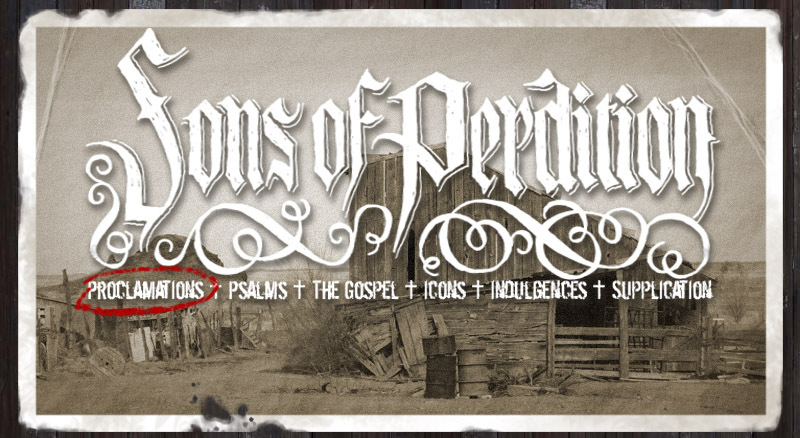 This fancy new player is the dark gray box just under the "About Sons of Perdition" header. If you like hearing these weary little laments, be sure to give GraveWax a yell of gratitude or a moan of woe.